Нашла на фейсбуке Дайте Евгению Плющенко его заслуженную золотую медаль! фотку суперскую. Они прибыли сегодня, но я видел только Эдвин разговаривал с организатором мероприятия ... : (Завтра я скажу вам кое-что .... KIssessssssssssssss! I don’t know if it’s ok for me to post my report on the show held in Bucharest here, but here it is. If it must be in a separate thread tell me and I’ll delete it from here. Thanks. Last night show was wonderful. I’ve never seen Evgeni and Stephane skate live, so that was the main reason I went, and I wasn’t disappointed. They were both great, in they’re own way. I must say Lambiel really impressed me, he really is an artist. He had great steps, spins, transitions, interpretation and effortless speed. He is very talented and I’m really sad I won’t get to see him competing. He did his Traviata program and “Ne me quittes pas”. Both were amazing. Evgeny and him managed to use every corner of the ice. I can’t say which programme I liked more, both were very well choreographed and with his interpretation, you’re just left speechless. His skating is so effortless. He had quite a few triples in all programmes, I can’t say exactly what triples, but he had the toe loop and maybe a flip, I really can’t tell. He had some 2A. As an Evgeny fan, I was glad to finally see him live. First, I must say that I can’t imagine how him and Lambiel managed so many jumps on that really small rink!!! Usually it’s a hockey rink, so add to that the chairs on the ice and you get a very, very small rink. However, we could see Evgeny do two 3A (or maybe 3…) and three 3/3 combinations (one in each program and one in the opening, I think) along with other jumps. At some point I really thought Evgeny was going to land in the crowd, but he opened the jump early and managed to land safely. He did his Tango program and a French piece “Je suis malade” (I don’t know if that’s the title, but that’s what the singers yells throughout the song – I really hate this song). For his Tango he was joined by Edvin Marton, he focused on the jumps, he tried to do his step sequence and made it very simple to feet the ice and probably not to step on Edvin, who was in the middle of the ice. I would’ve preferred to see him skate his sp, but it was ok. He skated right after the opening, so maybe that was difficult for him. Surprisingly, I preferred the Je suis malade program. He had a lot of speed and nice movements. I was surprised by his interpretation of the program, very subtle and elegant, and, of course, a very en force step sequence. I hope he can come up with other programs like this one, because he was great and it reveals a more passionate, focused side of his. As for the show itself, I liked the opening and the final number. Really nice to see them all do their best moves and see them all together. I especially liked the final number. Lambiel was the one to “introduce” Evgeny and when he came they both, hand in hand, did a face to face spreadeagle. Then Evgeny did his steps and went back to Lambiel, they repeated the move and Lambiel did his spins, with Evgeni pointing at him. They did it with conviction, so it looked like they were supporting eachother. It was a really nice moment (that I tried to describe as well as I could). The show was packed with interesting performances. Denis Ten did a half swan lake, half rock programme. In the first part, he had a tutu and really acted like a swan. It was a humoristic approach and it was refreshing. He only skated one programme. 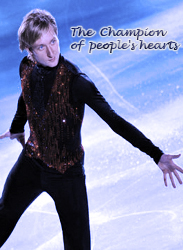 Florent Armadio skated two programmes, a Tango and a Michael Jackson medley. Both skated nicely. All acrobats numbers were good, one of the acrobats (the Ukranian guy, can’t remember his name) jumped over a car (and did a gymnastic jump). It was a little bit scary. In any case, the crowd really enjoyed those numbers, and I think that when done well they can really stick with you. Aliona/Robin and Tatiana/Stanislas skated their second programme together. It was interesting because at one point I was thinking that the Ukrainians had a better execution of pair elements (both pairs did the exact same movements). However, taken apart, the Germans solo programme was better. They really connect with each other and with the audience. Shocking as it may sound, Stanislas didn’t look that big in person. I think they almost fit well together. I can’t remember what programme they skated, I just remember looking at Tatiana and thinking how is she going to skate/fit with Trankov? The French were forgettable. They pretty much skated around and did some lifts and some connecting steps. Fleur Maxwell was ok, I guess. She was "lucky" enough to skate right after the break and not everybody was seated, so you could see people running around to get to their seat. She had no speed and, although she is incredibly flexible, she lakes control. She did a gorgeous charlotte, but held it for one second. It was nice to see Sebestien. Not much to say about her skate though. My apologies if I forgot a skater or two. On a side note, after the show Evgeni and Marton were the only ones scheduled to have an autograph session, but Lambiel came and gave some autographs and took some pictures (like one or two ). I don’t know if he is really shy or if he was tired. He was almost scared of us . After Lambiel left, we wanted to get him back, but one of the organisers send Florent instead. He was like, no, not me, I don’t want too , eventually he camed. No other skater came out of the hiding place (we were all yelling Lambiel, since Evgeny was already given autographs, we didn’t yell Fabien, though he had some tenacious fans ). The show will be on TV, so there might be some videos posted on youtube after. P.S. Lambiel and Evgeny spoke to the public after their performance. Lambiel seemed touched by the warm welcome and said some nice things, same for Evgeny. It was great, we felt appreciated too . I do hope they enjoyed the crowd, because it was packed (and the tickets were quite expensive compared to our incomes), I knew a lot of people will attend, but didn’t expect it to be so full. It was really great, and you could see people of all ages. анлоязычные - ау , переведите плииз. щас от нее видео с Женей будет. Ирина wrote: щас от нее видео с Женей будет. LOL did ceconi survived this? ?